The XXL Bulged Tubular BT180 Golden LED bulb, with its particular rounded shape and unique dimensions, is able to furnish and illuminate any room by itself, with the great charm of its warm and golden light! 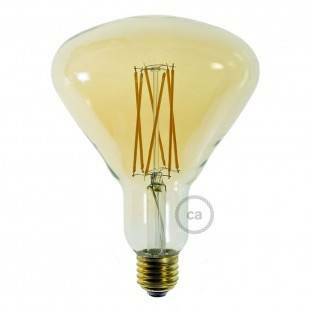 Despite the important dimensions and the brightness of 1000 lumens, equal to that of a traditional 75W bulb, its thanks to LED technology that this bulb has a consumption of only 11W and is dimmable: a perfect combination of vintage style and modern performance. With its E27 fitting, the bulb is compatible with many lamp holders in our catalogue: We really like it with the milled aluminum lamp-holder kit, available in three different finishes!